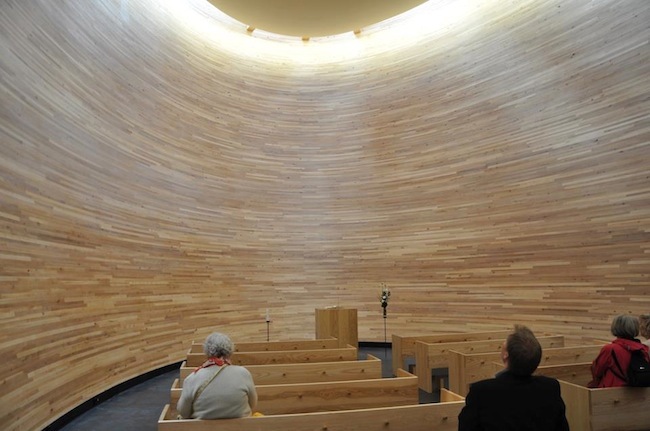 The Kamppi Chapel of Silence is one of the most outstanding objects to be found in the city of Helsinki – the 2012 World Design Capital. And it wouldn't even be much of a stretch to say it is reason enough to head to Helsinki this summer. 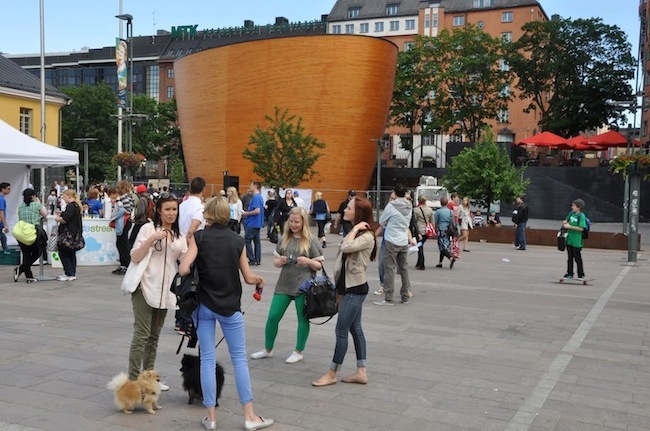 The chapel lies in the noisiest and ugliest square in Helsinki -- Narinkka – not far from that citadel of consumer culture known as the department store Kamppi. The square itself is always full of people -- a chaotically urban mix of ice cream and soda peddlers, skaters, youths handing out fliers to various events, and tacky advertising installations. In other words, a metropolitan hell. With this as its background, upon first sight, the giant, tub-like structure -- with its facade of curved wooden planks -- looks as if some divine, interstellar alien had just landed. The outer shell is made of pine, stained a comely yellowish-orange hue, whereas the inside of the structure is entirely lined in oiled alder wood. A narrow entryway, just a few meters long, leads to the door of the chapel like a pathway, and gives you a moment to prepare yourself as you swing open the heavy doors... and enter the silence. The inner chapel consists of nothing more than wooden benches and a symbolic altar; even though the chapel was built with the support of the Finnish Church, the architects stress that it is not a holy place, but rather an environment isolated from the surrounding urban noise and agitation, giving refuge to everyone who enters – a shield, per se. Services and religious ceremonies are not held here, and the small shelf -- perfectly lined with prayer-books -- is more of a design element than anything else. The space faintly smells of wood and is ruled by absolute, almost palpable, silence; due to the excellent acoustics, every so often the silence is broken by the footfalls of someone entering or leaving, or by the crackling of a plastic shopping bag – a reminder of the world outside. This intrusive indicator of the times and values in which we live seems to be the only unresolved flaw of the small, quiet room, which otherwise is a space of absolute harmony. Unfortunately, the real world is something from which we can never completely escape. But after spending just ten minutes in the chapel, you begin to stop hearing these extraneous sounds – the chaotic thoughts streaming through your mind gradually and peacefully draw themselves up into a cocoon of abandon. The chapel is 11.5 m high – the base is narrow and expands upwards, as if reaching for the sky -- a feeling bolstered by the elliptical roof, the edges of which let in a flood of sunlight. Consequently, the intensity of illumination changes according to the time of day and the randomness of the weather – from a crystal-clear blue to a pale and foggy gray. In its way, the Kamppi Chapel of Silence is reminiscent of a rehashed Auroville, set down in the middle of a European metropolis. Established in the 1960's by Mirra Alfassa, aka “The Mother”, as an “experimental township”, Auroville is currently one of the most popular sites to visit in India's state of Tamil Nadu. The heart of the small city is a golden, golf ball-shaped meditation center called Matri Mandir, which is open to everyone, regardless of religious or geographical affiliation. The building of the sphere took 37 years (1971-2008), and it is one of the most unique structures of its kind. A quintessential and emotional thread of elusive silence faintly tethers this Indian center to the chapel in Helsinki. 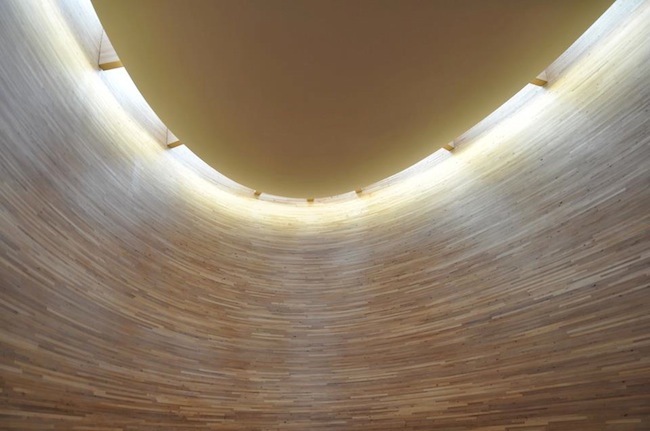 The creator of the Kamppi Chapel of Silence is the Finnish architect Mikko Summanen (from the office of K2S Architects). Even before it was fully completed, the project gained international acclaim in 2010 by receiving the prestigious Chicago Athenaeum International Architecture Award.